XTBG, Menglun, Mengla, Yunnan, 666303,China. 2002-2006 Kunming Institute of Botany, The Chinese Academy of Sciences, Ph. D.
1987-1991 Biology Department, Yunnan University, B. D.
1997-1999 Assistant Professor of Horticulture Department of XTBG, taking charge of the arboretum. 1991-1997 Working in the Horticulture Department of XTBG, taking charge of the arboretum. 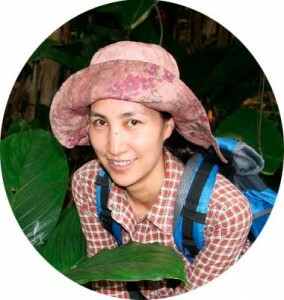 Dr. Zhang Ling studies the phylogeography and reproductive biology of Taccaceae and Zingiberaceae plants. Her research focuses on the sytematics and evolution of reproductive traits, the adaptive radiation and evolution of morphological traits, and the reproductive biology and population genetics structure in Tacca. By comparing the morphological traits and population genetics structure, they are now attempting to use DNA biocoding and the indagation of geographic distribution to understand the trends in ecology and evolution of these two plants. 1.Yan J, Wang G, Sui Y, Wang ML, Zhang L: Pollinator responses to floral colour change, nectar, and scent promote reproductive fitness in Quisqualis indica (Combretaceae). Scientific Reports 2016, 6:10. 2.Luo YH, Sui Y, Gan JM, Zhang L: Host compatibility interacts with seed dispersal to determine small-scale distribution of a mistletoe in Xishuangbanna, Southwest China. Journal of Plant Ecology 2016, 9(1):77-86. 3.Zhao YM, Zhang L: The phylogeographic history of the self-pollinated herb Tacca chantrieri (Dioscoreaceae) in the tropics of mainland Southeast Asia. Biochem Syst Ecol 2015, 58:139-148. 4.Zhao Y, Zhang L: The phylogeographic history of the self-pollinated herb Tacca chantrieri (Dioscoreaceae) in the tropics of mainland Southeast Asia. Biochem Syst Ecol 2015, 58(0):139-148. 5.Zhang L, Li HT, Gao LM, Yang JB, Li DZ, Cannon CH, Chen J, Li QJ: Phylogeny and Evolution of Bracts and Bracteoles in Tacca (Dioscoreaceae). Journal of Integrative Plant Biology 2011, 53(11):901-911. 6.Zhang L, Li QJ: Tacca ampliplacenta (Taccaceae), a new species from Yunnan, China. Annales Botanici Fennici 2008, 45(4):311-314. 7.Zhang L, Li QJ, Li HT, Chen J, Li DZ: Genetic diversity and geographic differentiation in Tacca chantrieri (Taccaceae): an autonomous selfing plant with showy floral display. Annals of Botany 2006, 98(2):449-457. 8.Zhang L, Barrett SCH, Gao JY, Chen J, Cole WW, Liu Y, Bai ZL, Li QJ: Predicting mating patterns from pollination syndromes: The case of "sapromyiophily" in Tacca chantrieri (Taccaceae). American Journal of Botany 2005, 92(3):517-524. 9.Liu Y, Qiu YP, Zhang L, Chen J: Dormancy breaking and storage behavior of Garcinia cowa Roxb. (Guttiferae) seeds: Implications for ecological function and germplasm conservation. Journal of Integrative Plant Biology 2005, 47(1):38-49. 10.Gao JY, Zhang L, Deng XB, Ren PY, Kong JJ, Li QJ: The floral biology of Curcumorpha longiflora (Zingiberaceae): A ginger with two-day flowers. American Journal of Botany 2004, 91(2):289-293. 11.Chen J, Fleming TH, Zhang L, Wang H, Liu Y: Patterns of fruit traits in a tropical rainforest in Xishuangbanna, SW China. Acta Oecologica-International Journal of Ecology 2004, 26(2):157-164. 12.Zhang L, Li QJ, Deng XB, Ren PY, Gao JY: Reproductive biology of Alpinia blepharocalyx (Zingiberaceae): another example of flexistyly. Plant Systematics and Evolution 2003, 241(1-2):67-76. 13.Li QJ, Kress WJ, Xu ZF, Mia YM, Zhang L, Deng XB, Gao JY: Mating system and stigmatic behaviour during flowering of Alpinia kwangsiensis (Zingiberaceae). Plant Systematics and Evolution 2002, 232(1-2):123-132. 14.Li QJ, Xu ZF, Xia YM, Zhang L, Deng XB, Gao JY: Study on the flexistyly pollination mechanism in Alpinia plants (Zingiberaceae). Acta Botanica Sinica 2001, 43(4):364-369. 15.Li QJ, Xu ZF, Kress WJ, Xia YM, Zhang L, Deng XB, Gao JY, Bai ZL: Pollination - Flexible style that encourages outcrossing. Nature 2001, 410(6827):432-432. 2007-2009 National Natural Science Foundation of China, “Research on the systematics and evolution of reproductive traits in Tacca”. P. I. 2007-2009 Yunnan Provincial Natural Science Foundation Grant, “Research on the adaptive radiation and evolution of morphological traits in Tacca”. P. I. 2003-2006 Yunnan Provincial Natural Science Foundation Grant, “Research on the reproductive biology and its population genetics structure of Tacca chantrieri”. P. I. 2004 Ten-Thousand-Species Project grant of XTBG, “Research on the reproductive biology and its population genetics structure of Tacca chantrieri”. P. I. 1999-2001 Knowledge Innovation Project, “Calcium content of fig plants and selection of high calcium content species in Xishuangbanna”. P. I. 1993-1999 XTBG Self-prepared Project, “Construction, Introduction and Domestication of Dipterocapaceae Garden, and Ficus Garden”. P. I.